I’ve worn contact lenses for many years and during that time, I’ve learned how important it is to do my best to keep my eyes healthy, especially while wearing contact lenses. I still remember when contact lenses were the “new” thing. Back then, they pretty much only had “hard” contacts – ones that almost felt like your eyes were getting stabbed with knives. Supposedly you had to “get used to it”, but I was never able to. Now, they have a variety of soft contact lenses available that are much more comfortable and can be suited to your eye and how often you’ll wear them. From daily wear to extended wear to contacts for astigmatism, there are many options for you and your eye care doctor to discuss. Once you find the right contact lens for your eye, here are a few eye care steps to help ensure that your eyes and contacts stay in pristine condition. Make sure you wash and dry your hands before handling your contacts. Use your contact lenses as directed – both in terms of when to replace lenses and any instructions from your eye care specialist. While extended contacts can be worn overnight, you reduce the risk of infections by removing your contacts before sleeping. 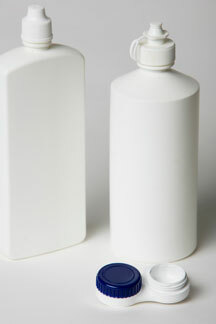 Use contact lens solution as directed and always use fresh solution in your lens case. Do not use tap water or “rinse” your lenses in your mouth. Clean your contact lens case after each use and replace it every 3-6 months. For more tips on how to keep your eyes healthy while wearing contacts, check with your eye care specialist.